Keeping a website up-to-date is often as expensive as creating it in the first place. It can be difficult and expensive for small companies to get comprehensive web sites up and running. The problem is that once they are live, it can be more difficult and more expensive to make even the littlest changes, corrections and additions. Content Management Systems, or CMS, can make it much easier for a company to maintain and control its own website. Today's CMS have become so easy to use that once a site is created, is is easy for staff to add pages, edit content, upload photos - even connect to Social Media. CMS offerings range from free, simple and fairly constrained to expensive, comprehensive and flexible. Geeks and Gurus will work with you to determine which CMS makes the most sense for your company. We'll work with you to get the initial site up and running. Then we'll train you to take over every aspect of your own website. We're available when you need us, but most of our customers are independently maintaining their own sites almost immediately after they are trained. Sometimes, businesses need a website that is an extension of their business - not just a marketing tool. StrataMark DS, in Cincinatti, OH, needed a Content Management System that was easy to use and compatible with their Microsoft-based infrastructure. StrataMark had a very clear vision for this new website and we worked with them to create the site using Sitefinity by Telerik. 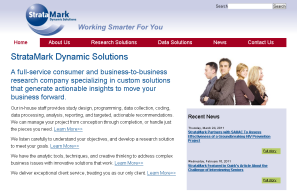 StrataMark has easily doubled the content on the site since we launched it in October of 2010. 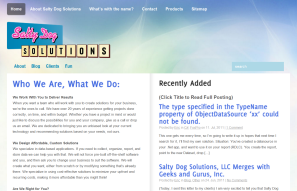 Eric Selje used WordPress to create his own corporate site for Salty Dog Solutions. In addition to the stock WordPress, Eric uses the Akisment plug-in to reduce his comment spam to near zero, a plug-in that backs up the database consistently and reliably, and an SEO plug-in to give his posts high visibility on web searches. If you're looking to customize your WordPress site, be sure to ask Eric for help with plug-ins that will get the job done easily and correctly. 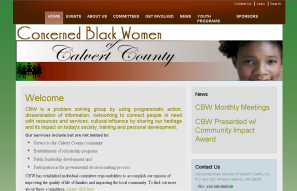 During the 2010 Southern Maryland GiveCamp, we had the opportunity to work with the Concerned Black Women of Calvert County to create a new website that could be easily maintained without the help of any developers or other technical support. Telerik offered free licenses of its CMS, Sitefinity, and DiscountASP.net offered free hosting to each of the non profits at the event. The non-profit provided the content, some graphic elements and design queues. Our Steve Bodnar worked with other volunteer programmers and graphic designers to create a theme and website that met the goals of the non-profit - all in one weekend!